I wanted to find a lamb quilt pattern that had lamb appliques that would closely match a crib set that I bought from Pottery Barn Kids. I planned to use fabrics that were antique white or cream fabrics, tan or dark beige and just a little bit of black as accents. 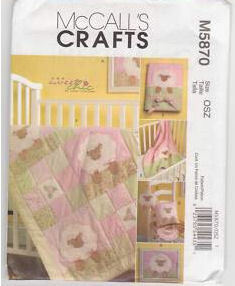 After I spent a couple of hours looking at a few free baby quilt patterns and some downloads (that would have been cheap if they had worked) I found the McCalls Sew Sweet Chic Quilt Pattern Number M5870 that would work with the lamb nursery bedding set (Sweet Lambie) that I bought from Pottery Barn Kids. 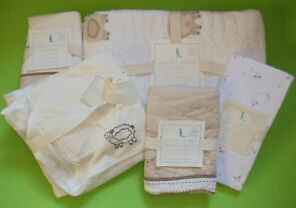 The lamb quilt pattern retails for 15.95 in the United States and has instructions for a matching pillow,a stuffed sheep toy and a baby bib. I would have loved to have used one of the free quilt patterns, but I was able to find this for a 50% discount in an auction and since I was able to match the lamb quilt fabrics so closely it almost looks like it came with the collection and I'm very happy with the results. This may not be the kind of lamb crib quilt that you need but if you have the PB Kids Sweet Lambie crib set, and were unable to find the crib or stroller quilt (it's sold out) this pattern will work like a charm! I found a used pattern for just a few dollars at a second hand store.